While it’s lovely to think that we can avoid most difficult conversations, in fact, they cannot be avoided. But, before we jump into that difficult conversation there is an opportunity to prepare. How we prepare for the conversation will make all the difference. This FREE 15 minute mini-course will teach you how to prepare to face a difficult conversation so that you have the best chance of a successful outcome. The workplace is filled with stress and conflict and confusion. We all think that most of this is avoidable but in fact it’s not. We have to deliver “bad news” or deal with people who are defensive or demanding. Misunderstandings are common. We’re working hard, fast, and under great pressure. Sometimes we don’t agree. We have different values and goals and opportunities. We mis-hear something. We give meaning and value to a comment that was not intended. Almost daily we are faced with having to have a difficult conversation. What will we do? We have two basic choices: Face it or avoid it. An overview of why fears occur around difficult conversations and how to manage them. How to choose what you are willing to risk in the conversation. Techniques to remain focused on the most important issue in the conversation. Ways to measure and determine your success before the conversation occurs. To BUILD your confidence and control your anxiety. My system will teach you how to control your “fight or flight” mechanism that runs your brain and take you past the fear that’s getting in your way. How to practice your state of BEing. So much advice tells you what to DO, instead of how to BE. My system will start from the inside out, starting with how to consciously control your state of BEing. To CHOOSE the right issue to discuss. I’ll take you through techniques to narrow down the issue you really need to talk about to be effective, so you won’t get sidetracked or ambushed. The RIGHT way to say what you want to say. Planning what you will say is like building the foundations down on a house. You don’t want to build in the wrong place, or with the wrong material. I’ll show you how to plan effectively so you design a conversation where you know exactly what to say. HOW to DECIDE how you want to say it. The same set of words can mean something completely different depending on the intention. Learn to control the message by consciously controlling how you are being. The IMPORTANCE of choosing the time and place for the conversation. Never get ambushed again with techniques to put YOU in control of the where and the when. HOW to be LOGICAL instead of emotional. We are all emotional beings, but this often works against us in difficult conversations. My system will take teach you how to stick to a logical track that will take you to the solution, and not get sidetracked by creeping anxiety or other powerful emotions. HOW to LISTEN with patience. A conversation is a two way street. My system will train you to deliver your message while at the same time making space for you to take in what the other person has to say. HOW to ACHIEVE a positive outcome for that difficult conversation. I’ll demonstrate how you can have a positive outcome, no matter what the other person says or does. 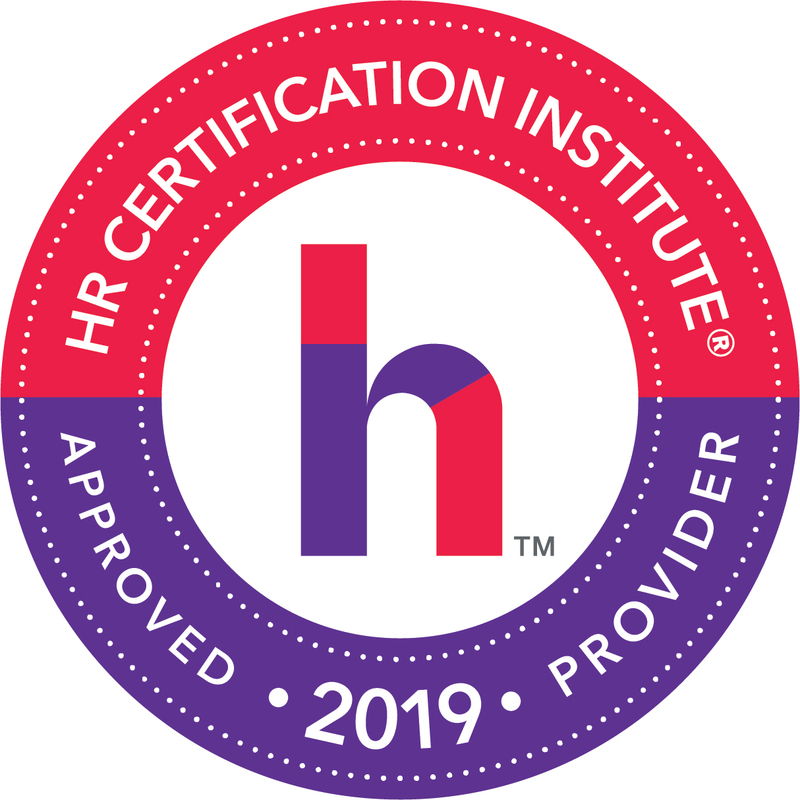 As a conflict consultant, Kathleen Bartle’s work includes using her tested proprietary theories and strategies for dealing with workplace conflict. 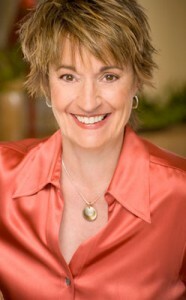 Her work helps her clients reduce the billions of dollars workplace conflict costs. Because of her years in academia and science, she has a thorough understanding of how competition fosters destructive and expensive conflict and how to resolve these problems effectively and ethically. Her research based strategies include individualized solutions to bullying, abrasive behaviors and interpersonal conflict among employees. 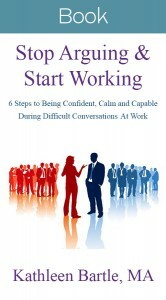 She is a humanistic sociologist and the author of: Stop Arguing & Start Working: 6 Steps to Being Confident, Calm and Capable During Difficult Conversations at Work. Her written articles, blog posts, and research opinions have been cited in national media publications. She has consulted with government agencies, nonprofits and for-profit corporations, fortune 500 companies, and science and academic research centers.